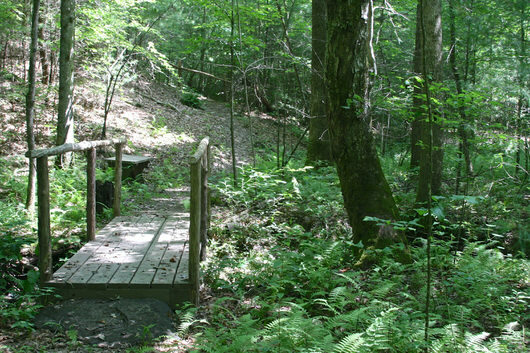 Have you been on a hike on one of the beautiful trails in Rugby recently? If so, then you are one of many who have benefitted from the efforts of the trail work volunteers! Trails are part of the historic tradition here, as the famous trail leading to both the Gentlemen’s Swimming Hole and Meeting of the Waters was built and used by the original Rugby settlers in the 1880’s! That trail is now part of the Big South Fork River and Recreation Area and is maintained by the National Park Service. In the 1990’s a modern residential area called Beacon Hill was developed according to the 1880’s town plan, including the original Beacon Hill trail, which circles the bottom of the hill and then climbs to the top where a bandstand overlooks the town. Later, a permanent walking path was built on the north side of Highway 52 linking the town together. Slowly a system of hiking paths was developed. Many of the new homeowners were avid hikers and they formed the Big South Fork chapter of the Tennessee Trails Association. Other than the Big South Fork trails, there were just a few old logging roads, remains of old trails and a couple of quiet country roads that people could hike on, so the community decided to build a trail through a narrow but scenic hollow that would link the Beacon Hill housing development with the Laurel Dale Cemetery. Developing and building the Laurel Dale Branch Trail was a joint effort by many residents of the Rugby Community. 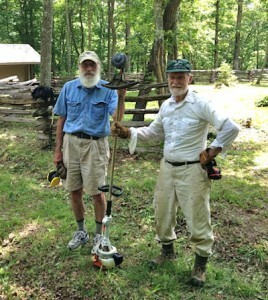 George Zepp and Rick Murphy spent a considerable amount of time locating potential trail paths along Laurel Branch. Julian Bankston finessed the proposed trail using GPS mapping techniques. On a cold, snowy morning in February 2000 a group of people gathered to start working on the new trail. Some of the helpers included Eric Wilson and Vi Biehl, Tom and Benita Howell, and Julian Bankston (and others listed below). Using an old jeep, Gerald Hanwright moved tools for the volunteer crew and singlehandedly laid up the burn piles for the downed wood. Weekend work crews continued until the trail was completed in September 2000. Historic Rugby was awarded a grant of $1775 by the Tennessee Parks and Greenways Foundation for work on the trail. 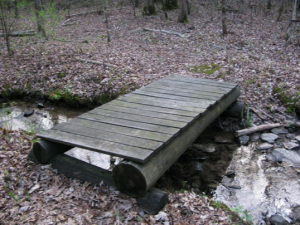 The money was used to build bridges across the creek and to purchase some equipment to do the work. In 2006 an Evan Means grant for trail improvement was awarded to the Big South Fork chapter of the TTA. Special markers were purchased and installed to identify specimen trees. Around the same time a new 667 acre Rugby State Natural Area protecting the eastern and southern boundaries of Rugby was created! The new RSNA brought two new trails to the system-the White Oak trail which follows the White Oak river to the northeast and the Massengale trail which goes up a ridge to the Massengale Homeplace on the southeastern side. 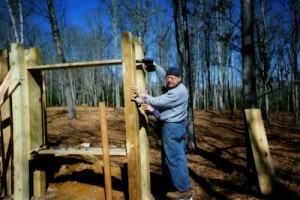 Historic Rugby obtained a state RTP grant to build a trail and the properties crew, including John Gilliat and Robin Sexton began work on the Massengale Homeplace and Trail in the winter of 2007/2008. Many Rugby volunteers including Bob Hemminger, Eric Wilson, Bob Fuchs and Lummy Massengale, a descendant of the original Massengale family, all helped to build the trail, bridges, steps, kiosks, black locust fence and viewing platform. The Rugby State Natural Area was dedicated in the summer of 2010. Although there is no longer a Big South Fork chapter of the TTA, there is still a group of avid hikers here who work on the trails. In addition to the folks mentioned above, other current volunteers including Carrie Thornthwaite, Mike Harris, Jim Meadows, Charles Gibbs, Steve Logan and Bob Trumbo help maintain the Massengale Homeplace and Trail, Laurel Dale Branch Trail and other trails that wind through Rugby. While specialized skills are involved in such tasks as cutting fallen trees, or mowing uneven paths, most of the work involved includes removing brush from the hiking paths, clipping tree limbs that hang down too far, weed eating plants encroaching into the paths, and picking up trash. There has also been a lot of work done by volunteers to help eradicate invasive plants, which will be featured in a different article. Nowadays it is possible to hike over six miles using a series of trails within and around our beautiful village! Work continues to connect many of the trails together to create an even more comprehensive trail system around Rugby, including the development of a hiking brochure for visitors. So, the next time you are hiking the great trail system here be sure to tip your hiking hat in honor of the many volunteers who helped build the trails and who continue to work so hard to keep the trails maintained for the enjoyment of all! And consider joining us! More volunteers are needed to keep up the trail system, so if you would like to help please visit our Volunteering page where you can download and send in the Volunteer Questionnaire or simply Contact Us. Thanks also to volunteers Peter Erickson, Fred Oliver, John and Kathy Hicks, Ron and Bethany Jackson, Mary Hemminger, Lavonne Gibbs, Boyd Mitchell, Wil Thornthwaite, Charles Lovett, Jerry and DeLois Boone, Ron and Lisa LeMarr and countless others who have worked on the trails over the years. We appreciate all of you! For more information on hiking in Rugby please click on The Outdoors. Information about hiking areas nearby Rugby can be found at Area Attractions.